Consciousness poses a most baffling problem in science of the mind. Oh well, I move onward — here is how… loving thoughts bring, with loving energy, loving feelings and loving emotion. It isn’t science. It works though. My purpose for blogging is to: write, share, enjoy, grow, and transform. Each visitor that I get to know contributes and thus, changes this experience with me. You are all as important to the experience as are the entire collection of my work and play here. We may each send out Ripples of Blessings, Ripples of Social Justice, Ripples of Goodness, Ripples of Peace, and Ripples of Loving-Kindness — sending these past any barriers and over or around any boundaries to merge with the ripples of other waves of other positive ripples. Drop a pebble in a still pond and watch the ripple travel out on an ever expanding wave ring. This video, The Ripple Effect is rooted in the belief that we are all connected by our shared Humanity. Two well known principles of physics are Wave Theory and Entrainment. Wave Theory: a wave will continue to travel out, never changing its initial shape or frequency and when two waves intersect each other, the height of the effect is the sum of the heights of the two individual waves. Entrainment: the tendency for two vibrating bodies to lock into phase so that they vibrate in harmony. The Goal of Humanity Healing™ is to make a lasting difference for positive change by supporting Humanitarian efforts that create sustainable solutions for the World’s problems — through a multifaceted approach of organizing Good Works, Education and Promoting Spiritual growth; mutual respect and understanding. Drop a pebble of positive intention into the still pond and watch patiently the ripple travel out in an ever expanding ring. My work is to love God with all that I can muster and to reflect love. Its my responsibility to want this. I like to keep this simple when I can. So, I’ll outline my process just a bit. It is simple; a huge challenge as well. By my understanding, God is divine pure love. Jesus provided ample examples of this. Here is another simple thing I do. I needn’t be concerned with what others choose to believe — if there may be a suitable exception, it will be quite rare. As I become more accepting, I tend not to attract much resistance to me being genuine. Progress in practice of love is simple too — the divine nature of consciousness that is inclusive of positive events and positive others is accepting of all else too. I’m not explaining God though. God needn’t be explained. We simply ought to seek to be love as best we may by the best examples and by daily spiritual commitment to further growth. This means daily to accept what is — even if, sometimes, at first, this is unacceptable. We are not in a position of authority over the happenings and the people. I do my best to focus on what is mine to influence or to change and to leave the rest be as is. Most of what is happening is beyond my influence and control. So, this is simple — but — not easy. For example, from a human perspective, I’ll clarify that this is simple for me to understand — whatever austere theology or rigid scientific view may level at me, and whatever negative pronouncement may come my way, and whatever may seem abhorrent at first; these all too contribute toward opportunities for my positive growth. Come what may, my reactive discomfort is of my making whenever I disconnect myself consciously or accidentally from loving grace. Of course, also though, I am limited by general health, functional ability and wellness of my body and mind. The last thing that I need to describe is also simple. I am to stay on task. This occurs when I can be at peace — inner peace. Its simple, but this is where I put in the greatest effort because its tricky in that the variety of experiences and the practices of others may become a distraction. I am to be responsible to live up to my end of the arrangement. This requires simple self-assessment tools to stay on task. Now, I still am learning about making and keeping accurate self-assessments. That is a process. It requires daily activity and inner peace and some action. I have some guidelines that I use. For example, I perform activities such as follow. What do I want (assessment)? Physical: body awareness, dissolve body tension, smooth unstable energy highs and lows, smooth stress-related disturbances, resolve homeostasis issues (blood pressure for instance), improve heart health, reduce or eliminate pains, improve fitness and athletic performance, eliminate toxins, improve health of skin and hair, etc. Mental: Clear focus on love and of corresponding daily objectives and even long-term goals, improving mental concentration, increasingly able to press pause or reset to soften negativity and self-serving thought patterns, lessening of self-criticism and of judgments of others, awaken to expansive loving compassion, slipping from any limiting beliefs and patterns, etc. Emotional: Notice feelings and corresponding thoughts. Ride through any resistance to painful emotion. Make plans to clear sadness, anger, fear and hurt from the mind and body. Spiritual: Increasingly focus on the present moment; deepen invisible connection with infinite loving God-consciousness, allow with detachment to awaken loving intuition. Plan to clear the barriers to loving myself and others — surrender to God-consciousness universal support. 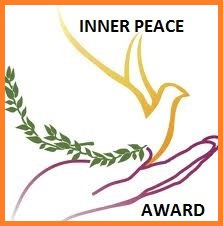 What tools are there for facilitation of inner peace and loving being? I do my best to put into the world the best of me. I do my best to stick to healthy objectives, sharing, and to be a source for comfort and compassionate empathy. I am imperfect and sometimes needy. Still, I do my best usually. There are lots of thoughts that pass by and some seem momentarily disturbing, exciting or entertaining or satisfying of a base need — they all may pass by — a life of loving action includes allowing many thoughts just to pass by; knowing the path of my way is to be from the heart. We may each send out Ripples of Blessings, Ripples of Social Justice, Ripples of Goodness, Ripples of Peace, and Ripples of Loving-Kindness. Language from heart is not exactly English and the translation from heart mind into English is a challenge. I hope that this post is useful for you or someone that you know. I pray that all will know moments of divine inner peace and that you may join me and others at The Ripple Effect. You may like: morning Meditation, outsmarting unhappiness, we exchange energy – always, and a series from Deepak Chopra, Spiritual Laws of Success for daily living that links to an Oprah/Chopra series on Desire and Destiny. Watch, a power is changing this world. Accept what you cannot change or change what you cannot accept. Is the brain spiritually wired? I learned about the ripple effect in communications undergrad. How if I say something mean to someone makes them feel negative, they something mean to someone else, so on, so forth. And so you are talking about reseting the brain when it encounters negativity so that the negativity does not move forward through other people; kind if like the bible talking about cyclical curses that need to be stopped. You’re right. What’s the point in struggling? What’s the point in trying to solve problems that can’t be solved? The point in trying to stop a freight train, so to speak? I’ll try to “find” my center…again. I confess! I’ve been reading a blog that is basically designed to upset people and emotionally feed masses of bored people. I’ve been using the negative blog to pull readers in to my blog for self-promotion 😞 …and I ‘may’ do it again? I don’t know. It’s for the greater good…if people are helped from my material?? Eric, Love the ripple, just about love it. I am so glad that I came across this today. I needed to see this encouragement and hope. We send out ripples all the time. I pray that we never overlook how much our ripples matter. Eric, I am impressed with how deeply you explore humanity’s truth and how well you understand this concept.. I love the ripple effect of nature…a great analogy for how we strive to live our life as truth seekers and spiritual beings.Our true nature is love, the essence of our being; without it we are lost. The noosphere is the dimension of thinking surrounding planet Earth. Just like people together in a closed room would be sharing their breath, we humans are sharing our thoughts and exchanging our energy, and that volume of thinking surrounds the earth, forming the noosphere. I’m glad to see that you have the comments up. I got my computer back and am once again enjoying the speed of internet without the thing freezing up! I actually was getting really lonely by myself at home with no other humans to talk too. Of course the weather has made me stir crazy too. I agree with this but my results of trying this experiment 4 years ago was much more successful than it is today. My post from a couple of nights ago, shows the negativity and depression of today’s age. I know in 2009, the media starting playing a part in the negativity I felt but it was able to be ignored. In 2012, the negativity got violent with the presidential election but then I watched as it fell silent. I know that we all have different opinions but when I started getting comments on the internet like murderer and Satan’s mistress for supporting environmental concerns (because cancer rates in children have risen where I live and it breaks my heart to see children I know dying of cancer), it rotted the good seeds in me to plant a positive field. I believe in freedom of speech and religion. I do. But I’ve been poisoned by my own medicine of encouraging people to dialogue and talk about issues instead of pointing and calling names. Now these people attack me. Sadly. I never thought I was popular on Xanga, but when I started a facebook to keep track of a few people who were not going to blog anymore, I attracted the trolls too and still have to kick some off due to their inconsiderate ways to attack my friends and what’s worse is that facebook uses their real names. This is terrible that we have to live this way but even more that they have rotted my seeds for a peaceful coexistence and hope. That is what has put people on edge. The fact that things are bad and not getting better and the negativity by the media is spreading. I believe in Baxters theory of plants and people and everything is connected, although I haven’t been able to connect why some parts of the world are having success while others are starving. The only other theories I have in why the world is diving into negativity and hate are pollution- causing our DNA to be imbalanced and effecting the way we think (based on study done of people who drive in the city and are exposed to 30 minutes of carbon monoxide and are poisoned, causing road rage), our food which are grown with chemicals, altering our DNA and messing with our hormones, and natural disasters that affect animals behaviors leading to the theory that humans react the same too. There have been many studies done about how global warming is effecting humans and their bad moods. I can only assume it’s causing the paranoia going along with it, however I recently learned that with all the nuclear tests done between 1945 to 1963 in the US, our DNA are already altered due to radiation and our offspring are starting to show the signs. I guess this is where nature balances itself. I can only assume that the reason that God is not intervening is because of the Free Will clause. The question is, how do we get humans to stop all this negative rippling? (*Note- the environmentalist are being attacked by extreme fundamentalists because of our lack of faith in God and we are part of Satan’s plan to misdirect people to believe in a Mother Earth, of course they decline to believe that in existence there lies a spectrum, good/bad, father/mother, happy/ sad, white/ black, etc. The claim about global warming is said by these people to be false propaganda and we play our part in revelations about being false prophets. Of course these claims are by people who say that Obama is the anti-christ, but now Pope Francis is the new anti-christ. What I’m finding is that there is a clash between people’s interpretation of God and the Bible. I even encouraged people to stand up and state their beliefs so we can talk about them but people are not willing to listen anymore and are starting to become violent which is causing a huge chain reaction in the human kind. *the comments about being a murderer is because Democrats favor environmentalism but because they support abortion, the name calling is assumed and claimed. I’ve had a lot of people not check facts before posting and have had to stay off of facebook because it’s the worst about people just sharing something that just simply isn’t true if you check the facts. It gives validation to opinions are facts now. I’ve noticed that I can’t get anyone to share a good idea on facebook, but anything negative goes. Negativity can’t win. Nothing trumps love. Extreme fundamentalists attack issues… They attack common sense even – environmental issues for example – saying there isn’t any reason for concern – its nonsense – They can’t win. They can attack all sorts of issues and they do. Some claim that the universe can only be about 6000 years old. They can’t win. They can’t trump facts with an ancient biblical reference that seems to indicate that the universe is only about 6000 years old and that it was created in six days. That didn’t happen in our universe that is nearly 14 billion years old. You are not alone in the world; left on your own to fight – in fact, there isn’t any need to fight. Facts and love are all that you or I need. Some Christians seem to tremble in fear. I say, there is no need for fear – fear is the enemy that is powerless unless it consumes us. Even when a small glimmer of hope remains, fear is powerless. I just condition myself to accept that angry self-righteous people that speak nonsense must need more love and more facts and I do my best to help them get what they need. You are a person that loves wholesome caring others – you are not alone. There are millions of others. None of us is perfect – but the more that we promote love and acceptance, the further we will reach towards compassionate acceptance and progress in civilized finding of solutions – because that is the solution. Now that I have my computer back, hopefully I can read and comment much more. I needed a purpose for the last leg of my life. This blog became a part of finding ways to be serving others and also growing again. I was getting stuck in the same-old-same-old a bit. Blogging with a loosely defined purpose (hunt for truth) put some passion into my days. Its making me a better person and that is what I wanted. What the heck – can rippling work? YES – watch this video! Dr. Jennifer Aaker, General Atlantic Professor of Marketing at the Stanford Graduate School of Business, tells an inspirational story of Sameer Bhatia and Vinay Chakravarthy, two friends who were diagnosed with leukemia. Their mutual friends were spurred to act and through social media started a movement for South Asian leukemia patients everywhere. Dr. Aaker explains how happiness was created through what on the surface was a sad event. This clip is an excerpt from a May 24, 2010 talk entitled Happiness is Miserable: Here’s Why.